Truckee is a mountain town. There's a kind of grit and grace to living here year round. Mountain men and women, gold rushers, homesteaders, early settlers-- our predecessors knew the meaning of hardship, sacrifice, and perseverance in a way that's hard to fathom now. Still, there are slivers of that tough pioneer commitment left in the groove and fiber of this place. Those of us who stay are here on purpose. It's not the kind of place you wind up in without intention, without weighing the beauty on one hand and the work on the other. For mountain lovers, the extremes of living at altitude are offset by the extreme privileges of its natural beauty-- from the stunning turquoise of Tahoe on a still day, to the powder of stars on a clear winter night. 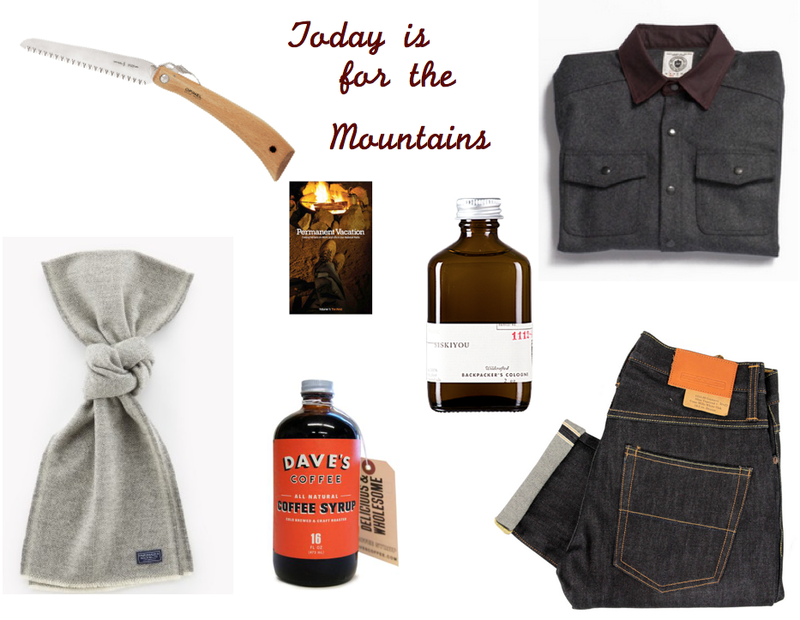 Here are a few of our favorite things, handmade and mountain-worthy. 1. Known for its simplicity and durability, the Opinel hand saw features a high carbon folding blade and safety hook. It's lightweight and portable. 2. If you can't live here, go on Permanent Vacation with this compact anthology from local press Bona Fide Books. It pulls together accounts from twenty writers on the experience of living and working in our national parks. 3. A bottle of backpacker's cologne from Juniper Ridge might not be the best idea for the trail, but it can help you bring the trail back to the world of screens and paperwork. 4. This is your chore shirt for life. From Muttonhead, in wool and waxed canvas. 5. Add a pair of Tellasons, and you might never buy another pair of jeans. 6. If you know a Rhode Islander, you probably know about Dave's coffee syrup. What you might not know is that Dave's Coffee is a family-owned, certified organic roaster. 7. Get extra brownie points with a Faribault scarf: classy and cozy. 1. When the temp drops, you can turn up the collar on your Curator jacket 2. A classic wool Faribault Scarf gets an update with fresh neon stripes. 3. Like a field walk after the rain. Brew a pot of white sage and wild mint tea from Juniper Ridge 4. Make a statement with a Laurel Hill mountain necklace 5. 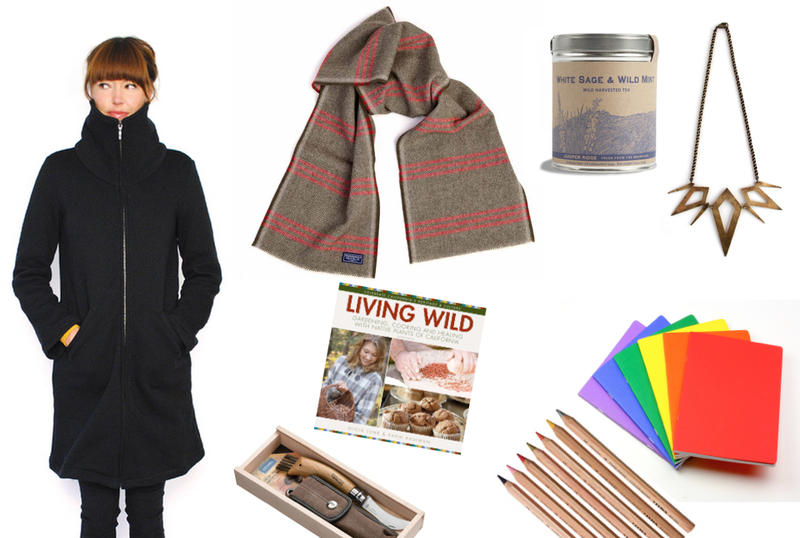 Tuck a box of art supplies away (notebooks, Lyra pencils) for snowbound afternoons 6. A great gift idea: mushroom hunting knife and tools from Opinel 7. Take the advice from Gary Snyder's poem "For the Children": stay together/ learn the flowers/ go light. Gather some friends and learn to cook with Sierra Nevada plants. Living Wild cookbook.